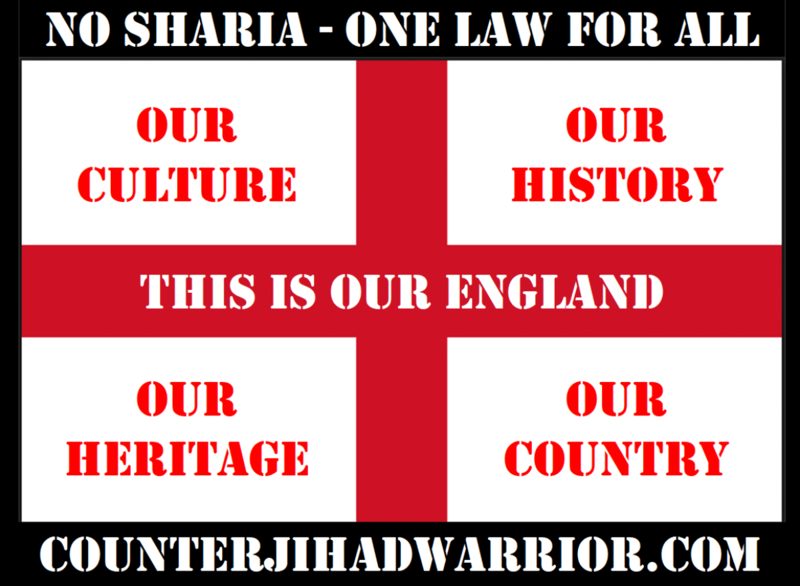 free tommy Archives - counterjihadwarrior.com - Because Islam will NEVER EVER be a Religion of Peace - rather a barbaric, totalitarian cult, based on fear, violence, intimidation & terror. As most of you will know by now, Tommy Robinson was arrested, charged, convicted and sentenced for Contempt of Court by a judge at Leeds Crown Court on Friday 25 May 2018. Since then, there have been numerous “Free Tommy” demonstrations up and down the country, with tens of thousands of people demonstrating outside Downing Street in Whitehall on several occasions in May, June and July. 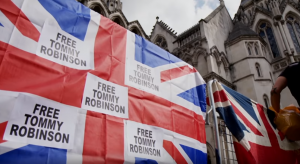 An appeal to Free Tommy was launched and crowdfunded by Ezra Levant, the founder of Rebel Media in Canada, in conjunction with Tommy’s family, and was originally scheduled for Tuesday 10 July. The Crown asked for more time to prepare and the appeal was finally heard on Wednesday 18 July. I was there at the Royal Courts of Justice on the day, and had the honour of meeting Ezra Levant in person. He had flown in from Canada specifically to cover the trial, and live-tweeted the proceedings as they unfolded in the court. Tommy Robinson himself was not present in the court, but appeared on a video-link screen. He looked relaxed and engaged with the proceedings by confirming that he could see and hear everything that was going on in the courtroom. The appeal was heard by the Lord Chief Justice for England and Wales, the Rt Hon Sir Ian Burnett who was sitting alongside the Hon Mr Justice Turner and the Hon Mrs Justice McGowan. 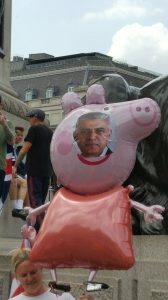 There were around 50 members of the public in the gallery, with maybe another 50-100 demonstrating outside with flags and banners proclaiming “Free Tommy – Free Speech” – although everyone inside and outside the court appeared to be on their best behaviour – and in fact the judge commented on how well-behaved the public gallery was considering the amount of interest that had been generated in the case. Mr Jeremy Dein QC opened with the arguments for the defence, and it quickly became apparent that the defence team were seeking not only to have Tommy’s conviction at Leeds Crown Court quashed, but also to have his conviction at Canterbury Crown Court one year previously overturned as well. The arguments were twofold – that proper procedures had not been followed by the judges in either case, and that even if the convictions for contempt of court were to be upheld, the sentencing was disproportionate and Tommy should therefore be released with time served. The barrister for the Crown, Mr Louis Mably QC, put forward some counter-arguments to suggest that on the contrary, there were no anomalies in the procedures employed by the judges at Leeds or Canterbury, and that the sentence was proportionate under the circumstances. Then it was time to break for lunch. During the lunch break I had an opportunity to talk with Ezra Levant and to get his thoughts on how he felt the case was progressing. He said that the senior judge appeared very fair-minded and displayed some sympathy with the defence position through his questions and interventions. I was interested to see a couple of Orthodox Jews in the public gallery – they declined to have their photographs taken but expressed great concern for the issues raised by Tommy Robinson during his campaign to highlight the depravity of Islamic grooming gangs. 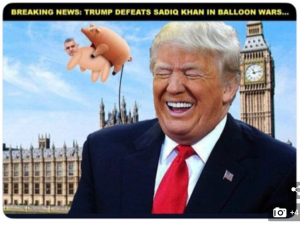 It just goes to show that the Tommy Robinson case affects all non-Muslims and not just the “racist”, “bigoted” and “Islamophobic” white working-class people as they have been unjustly portrayed in the mainstream media. Now this is my personal opinion, but I had a feeling that the senior judge, the Rt Hon Lord Chief Justice Burnett was leaning more strongly towards the arguments put forward by the Tommy’s defence counsel, and less strongly towards the counter-arguments put forward by the Crown prosecutor. However, after a short recess, the judges returned to announce that they were going to reserve judgment for the time being (not unusual in cases of this complexity) and would do their best to deliver a judgment before the end of July. Naturally this result was a little bit of a disappointment to those in the public gallery who were hoping that Tommy would be released forthwith, but at least the judges did not dismiss the appeal out of hand, and no doubt wished to evaluate the impact of any precedent that might be forthcoming as a result of their judgment. I have included here an interview with Vlad Tepes in which I elaborate on my thoughts concerning the trial and the events surrounding it. When the date for the final verdict is announced, I intend to travel down to the Royal Courts of Justice once more in order to report on the proceedings and hopefully to interview the various personalities involved with the case and to get their reactions. Watch this space!